The First Class School Chair Accessories are able to add extra accessories for your first class school chair. The additional accessories provide another level of comfort and abilities that the standard options may not be able to offer you or your loved one. The accessories are all fitted to work with the First Class School Chairs by Drive. All accessories are made with the same durable and sturdy design that has been synonymous with the Drive Medical products. Accessories for the First Class School Chair are easy to maintain, simple household tools that you may already have available could be used to keeping the accessories clean and at proper working condition by removing dirt and grime build up which may affect the functionality of the accessory and harvest bacteria. 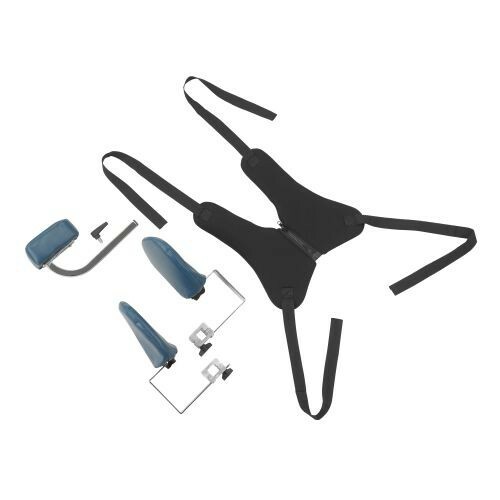 These accessories are all securely fastened once they are placed or attached to the school chair; reducing any worries you may have about the stability of the product. The FC 2024 (fits FC 2000N) the and FC 4024 (fits the FC 4000N) are trays that can be attached to the top of the school chair for play and feeding. The tray would attach to the armrest and would not need any new holes to be drilled into the chair. The tray would provide a stable and leveled surface and hold some contents within the top of the tray as it includes safety lips on three sides to keep contents from spilling over. The FC 2029N and FC 4029N are wheels that attached to the legs of the chair in order to give it mobility. There are four caster wheels with each set and attaches with no trouble to the chair. The caster wheels are made to glide on hard surfaces and short carpets - for safety purposes, the chair should not operate with anyone on the chair when being pushed on surfaces that cause friction and difficult to push. The wheels would be attached to adjustable legs with the option of setting a preferred height. The rear wheels are equipped with brakes and anti-tippers for additional safety. The FC 2030N and FC 4030N are anti-tippers for the chair without the inclusion of wheel attachments, they are meant to provide stability and prevent the chair from being tipped backward. Unlike other tippers, this option of anti-tippers spread out in opposite directions and not precisely behind the chair as others would; this method is best for preventing tipping. The FC 8001 are a pair of push handles which can be used along with the caster wheels to maneuver and push the chair with the ability to control the direction of the chair with ease. The handles are cushioned as to provide a soft and pleasant feel for the caregiver. The foam-type grips allow for an ergonomic feel and natural grasp on the handles. The FC 8027N is a Hip Guide for the First Class School Chairs, it works with the FC 2000N and FC 4000N models. The hip guide can be adjusted by width and depth to provide the most optimum position. The hip guides are best suited for people who are aware of constant adduction occurrence and are needing a fix to adjust themselves properly. The FC 8000N is a Headrest accessory for the chair, with easy installation, the addition of the headrest will offer the user support and ease neck pains. The headrest is set from 4.5 inches and can be raised up to 8 inches in total height for taller users. The headrest is easy to wipe clean and maintain. A footrest option is also available. he FC 8025 LN and the FC 8025N are combined kits that include the Trunk Harness, Abductor and Lateral Supports. The kit is offered in the two sized options of small and large. Purchasing in a set makes the purchasing of these items easier. If you were to forget something or accidentally ordered the wrong item, returning it for the correct size creates a hassle.